How the heck do I get to Riot Fest? Let us show you how. W. Ogden Ave. & S. Sacramento Dr.
Take the Pink Line and exit the train at the Kedzie stop. 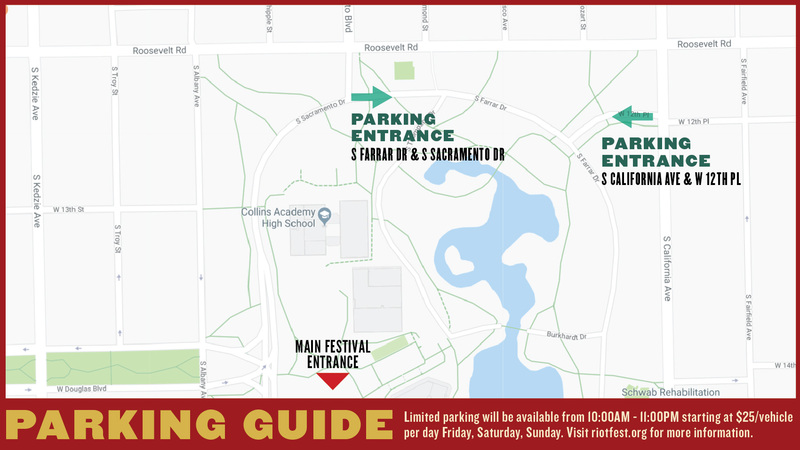 Once off the train, head north on Kedzie towards 19th St. Make a right (east) on 19th St., then a left on Albany Ave. Head north on Albany Ave, then turn right on Ogden Ave. and the Riot Fest entrance will be on your right at the corner of Ogden Ave. and Sacramento Dr. Total distance is .52 miles. Take the Pink Line and exit the train at the California stop. Once off the train, head north on California, make a left (west) on 19th St., then a right on Albany Ave. Head north on Albany Ave, then turn right on Ogden Ave. and the Riot Fest entrance will be on your right at the corner of Ogden Ave. and Sacramento Dr. Total distance is .71 miles. Just around the corner from the entrance to Riot Fest, the CTA is the most convenient way to get to Riot Fest & Carnival in Douglas Park. Riot Fest is actively working with the CTA to increase service and frequency to and from Douglas Park. Please visit TransitChicago.com & the links provided below for service hours and more information. 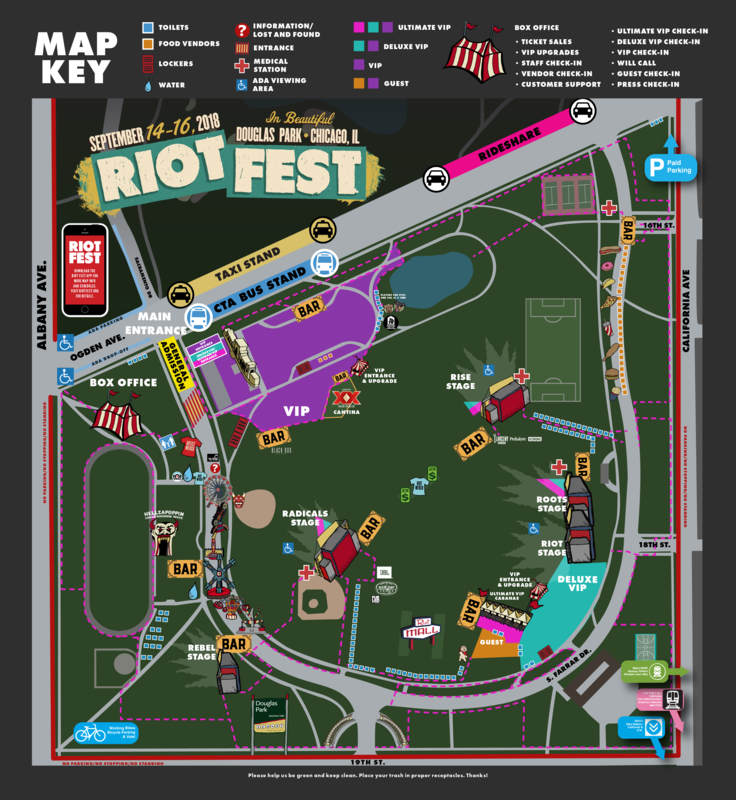 To accommodate passengers attending Riot Fest in Douglas Park, a modified schedule will be in place from Friday, September 14 through Sunday, September 16. Certain trains, will make additional stops at Western Avenue. 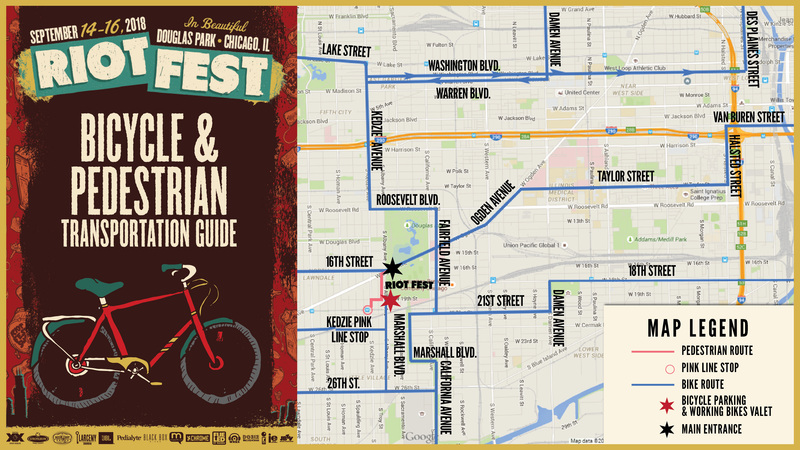 Riot Fest urges fans to either take public transportation, or ride a bicycle to Riot Fest. These are the most effective, environmentally sound, and neighborly methods to get to Douglas Park. The CTA Pink Line’s California Ave. stop is just blocks away from the festival entrance – the most convenient route to the fest. Metra’s BNSF Railway also offers an easy way to get to the fest. Some trains will make extra stops at the Western Avenue station. A limited amount of parking will be available starting at $25. Entrance at 12th & California, and Roosevelt & Sacramento. Friday –Sunday, 10:00am – 11:00pm. If you must drive, please respect Douglas Park residents and do NOT park on residential streets surrounding the park. Taxis and Ride Share pickup and drop off will be on the North side of Ogden Ave between Sacramento and California Ave. Located near the corner of Ogden & Sacramento.